Don’t miss this exciting event, open to people of all ages! 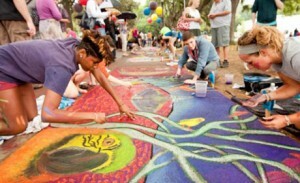 Presented by The Starkey Hearing Foundation, the 2nd Annual Nashville Chalk Fest is a *free*, family-friendly, 2-day street painting festival with entertainment, food, and fun; featuring sidewalk chalk art by professional artists, hobbyists, and art enthusiasts from across the country. Nashville Chalk Fest was first held in 2015 to benefit the Vanderbilt Bill Wilkerson Center Department of Hearing and Speech Sciences in support of the Preschool for Children with Autism and the Mama Lere Hearing School as well as other hearing and speech programs. The Vanderbilt Bill Wilkerson Center Department of Hearing and Speech Sciences has provided hearing and speech services to patients of all ages and their families for over 60 years, offering every patient compassionate, personalized care. Times: Saturday, September 24 from 9 a.m. – 7 p.m. and Sunday, September 25 from 11 a.m. – 6 p.m.